I’ve spoken already of the importance of neighborhood in Milanese life, of the way you grow to know those who give you your daily bread, coffee and apple. This morning I was reminded again of how gratifying it is to be enclosed in this circle. I’d gone into the fruit and vegetable vendor’s first, loading up on things I must write about one day—dolci di Napoli (olives), cachi (persimmons), and puntarelle (a green shoot in the chicory family served in a vinaigrette of anchovy and garlic). I then stopped at the salumeria to pick up the anchovies, only to become embroiled in a discussion then and there on the differences between the tinned and salted varieties and how, should I be brave enough to chose the latter, they should be cleaned: not washed under running water but scraped free of salt and skin. Leaving the salumeria, I realized I’d forgotten to buy garlic. So back I went to the fruttivendolo. In five seconds, I was in and out, garlic in hand, having said very little and having paid nothing. The woman who runs the place with her husband, had simply picked the prettiest little garlic in sight, handed it to me and said, “Prossima volta,” meaning “Next time.” You can pay next time. Credit exactly this hard to get—small and large—is extended all the time. 17 euros at the bakery for four portions of spinach and ricotta ravioli. 2 euros for a cappuccino and a brioche I just had to have, despite being penniless. A rack of lamb. A dry-cleaned coat. We are all as good as our word, and our constant presence is our most valuable collateral. This is a given. If you can’t pay now, you can pay later. 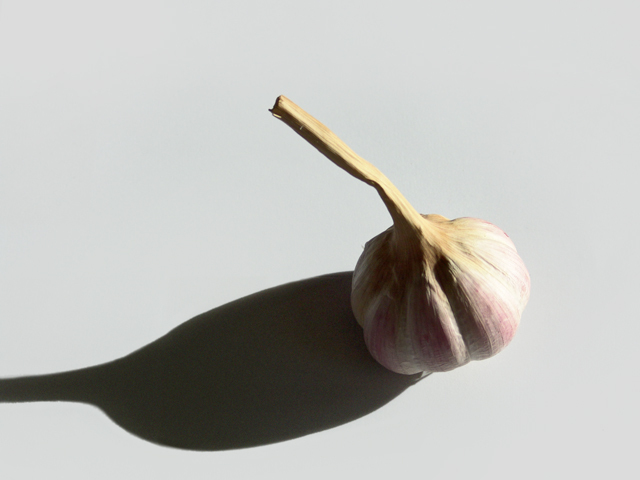 And sometimes, as will probably be the case with this garlic, la prossima volta simply doesn’t ever come to pass. I’ll offer to pay, and it will be waved away, with a wink. Because, after all, one more euro in a vendor’s till isn’t likely to make him or break him. For him, the loss is non-existent. But for me, this tiny gift feels like a huge act of humanity, of respect. It’s the least he can do, in the end, for someone who comes and buys from him again and again and again. And it’s part of the reason I do precisely that. Thanks to Ann Moore for copy-editing this post. This entry was posted in ITALY, THEY SAY and tagged Italia, Italy, prossima volta, reciprocity. Bookmark the permalink. familiar face….familiar movement…..something warm, safe and comforting in that. congratulations, you live there.